Right now, Serena Williams is busy doing what she always does, which includes being a badass and making tennis history. Her July win at Wimbledon was her third Grand Slam win this year, and the 21st Grand Slam of her career. If Williams wins the U.S. Open, which began Monday, then she will have 22 Grand Slam titles — a number previously only accomplished by Steffi Graf in 1988. 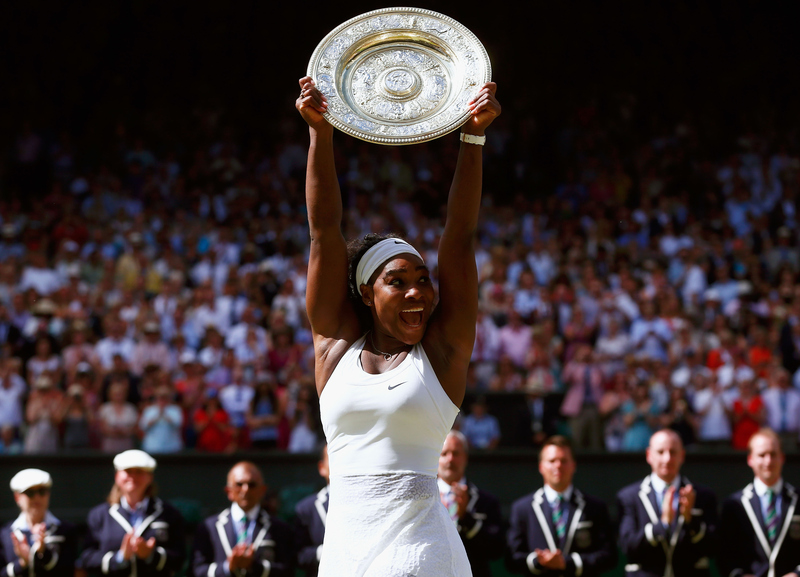 So what is a "Serena Slam," and what does it mean for Williams? If she gets one more, then she will make history. Grand Slams refer to the four major tennis tournaments that are held around the world each year. Fans dubbed each of Williams' first career Grand Slam wins in 2003 a "Serena Slam." She had won the Australian Open and claimed her first career Grand Slam, which means that she won all four of the major Grand Slam tennis tournaments held in one calendar year. Williams could win her second Serena Slam if she wins the U.S. Open. This would also be her 22nd Grand Slam win, tying her with Graf in second place for the highest number of Grand Slam titles — second only to Margaret Court, who won her 24th Grand Slam in 1975. If Williams wins the U.S. Open, then it would also break her tie with Chris Evert, who currently boasts the most U.S. Open wins. So far, Williams has won eight straight rounds against Vitalia Diatchenko at the start of the open, before Diatchenko had to pull out because of an injury. Williams also apparently looked "sharp" in her practice session on Tuesday. It's kind of awesome that this is the last grand slam of the year. If it were in a different county I would still love it but it's not the same as being an American playing in New York, playing for that ultimate goal. Sometimes if I'm down I need to have a little extra fight, a little more power and passion. But there's also a calm that I need to tap into to do the best that I can as well.